The President was responding to remarks by Cantor, to reporters, that the $447 billion measure was “dead” as a package. “Yesterday, the Republican Majority Leader in Congress, Eric Cantor, said that right now he won’t even let the jobs bill have a vote in the House of Representatives. He won’t even give it a vote. 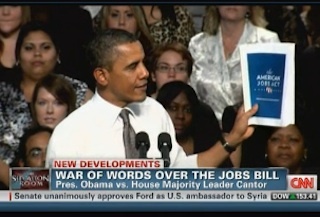 Well, I’d like Mr. Cantor to come down here to Dallas and explain what in this jobs bill he doesn’t believe in. Does he not believe in rebuilding America’s roads and bridges? Does he not believe in tax breaks for small businesses or efforts to help veterans? Mr. Cantor should come down to Dallas, look Kim Russell in the eye, and tell her why she doesn’t deserve to get a paycheck again. Come tell her students why they don’t deserve to have their teacher back. Come tell Dallas construction workers why they should be sitting home instead of fixing our bridges and our schools. Come tell the small business owners and workers in this community why you’d rather defend tax breaks for millionaires than tax cuts for the middle class. So that’s from the President’s remarks today where he will focus on teacher layoffs and what the American Jobs Act does to put up to 280,000 teachers who have been laid off back to work and up to 400,000 total teachers to work. Q So Cantor said that he didn’t think the entire bill would go up for a vote on the floor, but he did say that he thought individual components would go up for a vote. And the Republicans have put out lists of things in the bill that they do support. So isn’t it disingenuous for the President to keep saying that they haven’t told him what they support when they have? MR. CARNEY: That’s not what he’s saying here. First of all, what is Mr. Cantor afraid of? Why not put it up for a vote and show where he stands and where other members of Congress stand? If he doesn’t support — as apparently he does not — if he does not support putting teachers back to work, demonstrate that through your — through his vote. If he doesn’t support putting construction workers back to work, show the American people that fact. As I have said repeatedly — and the President himself has said — if Congress, having voted on the entire American Jobs Act, then sends him portions of it or sections of it piece by piece, he will sign those if they are paid for in a way that’s responsible and balanced, and then ask where the rest is. So we’re not — the criticism that this is all or nothing is disingenuous. It’s a red herring. It’s false. Every section of this American Jobs Act is worthy and has this President’s full support. All of it is worthy. And the point the President is making is simply that if Congressman Cantor or others in Congress, Republicans, don’t believe that we should be doing something now to put teachers back to work, that we should be doing something now to put construction workers back to work, that we should be doing something now to incentivize small businesses to hire veterans — say so. Vote — vote accordingly. But don’t hide behind letters you send to the President. Just tell us where you are. Tell us where you stand on those issues. And if there are things that they are supportive of that are in the jobs act, well, good, let’s get those done. But first of all, the Senate and the House should vote on the entire bill and explain why, if they oppose it, why they oppose it.